a promise of venom burning on my skin. as their eyes excavate our life below. you touch me with the point of your breast. Today Grace presents Carilda Olivar Labra at Real Toads and I was particularly impressed of the love juxtaposed with politics especially in Declaration of Love written during the Cuban Missile Crisis in 1963, and this took me back to the cold war when the threat of missiles seemingly hanging over the world. With the current events going on in the world I fear for a return of this and even worse. I intend to link this to Poetry Pantry as well tomorrow. There’s a common vibe in the poems that have been posted in response to Grace’s min-challenge — love in a time of danger: the sense that just when love is about to blossom it will be eliminated from the face of the earth. You poise it so archly here — it’s an almost sexual tension, to be so close to release and annihilation in the same breath. Indeed.. That parallel is the most aching and seemed to be a thread in all the poems I could find relating to the challenge. is my favorite. Great response Bjorn…fits the tone of Carlida well, I think. Missiles waiting to destroy – sigh – a fact of life we don’t often contemplate. Destruction can take place with the push of a button – a scary thought, but today’s world. Whew, a powerful poem. Hey Bjorn–horrible to think about this overhanging destruction–the clash between the intimate and the crazy impersonality of a missile system very palpable. Thanks much! k .
ps –thinking of you today–finally we have very deep snow here and it is not a work day or City day for me so went cross country skiing! It’s a bit powdery to be really good–hard work in other words–but not so cold and beautiful! k.
We have wonderful winter really, but with a cold lingering I have to be a little careful. What a powerful juxtaposition Bjorn. And the anonymous threat of destruction emphasizes the importance of the intimate loving. So much I can say about this fascinating piece.. On the Juxtaposition standpoint, when in danger, we often retreat to a safer place, hence the reason as to why we seek comfort from the things that could ultimately bring about our destruction and love and war both have the tendency to do just that so it’s also very ironic that we would choose one or another when both are capable of breaking us. Should we choose love and passion or war and vengeance? Can we let go of what haunts us the most? Very powerful and intense piece here Bjorn. Very thought provoking as well! Well done! Such an exquisite intermingling of Carlida’s inspiration with your own powerful way with words. I love it. Beautiful. Brilliant poetry, Bjorn. Scandinavian countries, though often seen as neutral, are really situated between a rock and a hard place. Your homeland could be in the direct line of fallout, especially of concern now old cold war aggressions seem to be rearing their ugly heads. Your poem shows so well, how innocent lives are caught up in the fight for balance of power. I really must start visiting Toads more often! What wonderful poems these are! And yours is an equally wonderful homage, as well as expressing your own concerns. Face it, love does drive you crazy. The interspersing of sexually allusive words was enough to make your readers think that way too. Great contrast between the third stanzas and the other ones. But because your words go back to the threat felt by the persona, we are left with a taste of fear and impeding chaos. Yes, great juxtaposition of imagery of love & war. Hauntingly beautiful. Beautiful. The courage to love in the moment. For a number of years I lived less than ten miles from a company that designed missiles and some of us knew it was in this regular looking office park and knew it had a soviet missile pointed at it. I slept easier when the company moved out of state. Very well expressed and therefore so scary ‘thirst of shadows’ . Powerful poem, contrast of life and death…we all co-dependent. 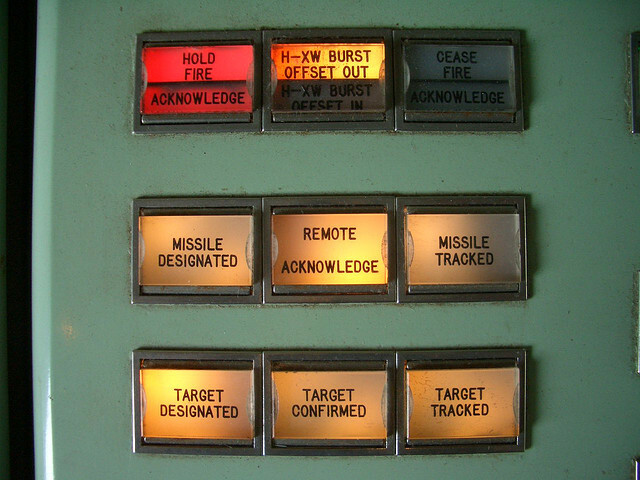 Though you leave out the “whose is bigger” aspect of missile warfare, the parallel of the impending sexual act and pushing the button brings it home–the obscenity of something so personal and potentially beautiful is linked to impersonal destruction. Obscene and ironic, ie, brilliant. I feel like your poem is a reminder to live in the moment. There’s so much out in the world that we can’t control, so worry is wasteful. Great writing, Bjorn!! I live not-too-far from an Air Force Base. A few times a year training camps are held there. When I hear the sounds of airborne war machines near my home I always consider the generations of others who have known little else. Oh Bjorn, so much to love and mourn in this poem. The thought of a (quite likely deranged) person contemplating the Buttons, not giving you more time to love is terrifying. A completely stellar write. Wowzers! This brought to mind how many times, in spite of war, fear, destruction….love still blooms. Nothing can kill love. A very moving and sensual poem. A powerfully sensual poem . Stunning. Great writing Björn, really sensual poem. Like it muchly. Some sensual word play, that could lead to a dangerous liaison. Written in your own unique way..smiling..
That kind of romance below the moonless night is really something. You painted a scene in a complex situation yet managed to bring the sensuality in whole new level. Great one, Bjorn! I think this preys on my mind too and has since the early 60s…. This is beautiful with the passion of love and the threat of destruction. I wish no one had to make love in the midst of war. I wish there was no war. I just wish. Yes, I would be something like that- being with your loved one for the last time, knowing all to well that its time when everything goes caput… I suppose it would be. Smiles. when a unknown finger presses the button..the destruction of life happens and the love which binds all becomes even more precious.. Some of the fright we used to feel — being squeezed between the superpowers is coming back gradually… Just like Kerry writes. Wonderful acknowledgement of the Cold War worries so many people had. A wonderful portrayal on how fear of running out of time can draw people closer and teach them to live in the moment. The intensity, the urgency of such a situation, love in a time of war/doom, is quite felt. Whew. I think you really “captured” her (Carilda) here. It would seem, humankind is programmed to moil on in the shadow of doom – no matter what. Though, then again, what is the alternative. Your words always make my brain work harder, which is what I like about poetry. That you see the world in speech bursting forth like sparrows is a thing my brain would not have come up with on its own. Thank you for taking me there.